— Exclusive Australian and New Zealand agent Dr Serene Lim. The secret to SQOOM's success is in its natural, organic, chemical-free, preservative-free German gels and world-leading patented Synchron technology (ionisation and ultrasound). The ultrasound vibrations separate the skin cells to allow the ionisation energy to drive the products deep into the skin tissues. The transducer vibrates at one million vibrations per second to exfoliate the skin, deep cleanse and reduce pore size. And it is set to replace your regular microdermabrasion and facial visits - the appearance of visible red veins, pigmented spots, and scars simply fade away. SQOOM also has benefits for post-procedure facelift patients or those who love the no-lines effects of wrinkle relaxers. It hydrates the skin and increases elasticity to ensure no visible facelift give-aways and reduces the number of wrinkle relaxer treatments needed each year. The main ingredients in the gels are celebrated anti-ageing elixir hyarulonic acid, aloe vera to moisturise, argireline for a wrinkle relaxer effect and panthenol, jojoba oil, and chamomile extracts to soothe the skin. The SQOOM fragmented hyarulonic acid has been specially engineered to create smaller molecules that can be driven by the software technology deep into the skin. SQOOM replaces your current skincare products with its skin-health regime, which can be used nightly initially followed by maintenance once or twice weekly in eight-minute sessions. Five different programs are available with specific gels: Cleansing, Massage, Lifting, Whitening, and for Sensitive Skin. The gels (cleanserGel, xcential hyaGel, DeSpot Gel, medgel) must be used with the SQOOM device. Facelift, filler, skin nutrition, skin whitening, wrinkle-reducing, pore refinement, deep cleansing... SQOOM is the ultimate skin health and beauty regime to replenish hyalyronic acid stores for soft, elastic skin; aloe vera for plumping; herb argireline to diminish wrinkle appearance; and skin food and ingredients that fade away pigment abnormalities and discolouration, and combat other signs of ageing. It can be used on the decolletage and 'hard to treat' neck and upper-lip wrinkles, backs of hands, breasts, and any part of the body that needs a youthful rejuvenation. You can start a regular SQOOM regime in your 20s to delay the ageing process. A winner of the Men's Category in the European Beauty and Spa Awards, SQOOM is especially good for treating big pores and visible red veins, which men tend to develop. At one million vibrations per second, the ultrasound component exfoliates the grime and subom from white and black heads, then tightens and diminishes pore size. The ageing process thins the skin, making veins more visible; SQOOM reduces the appearance of reddened skin by improving skin health. A holistic acne solution. SQOOM is the first breakthrough product to use ultrasound with a targeted specific frequency to totally unblock ducts, while gels combat scarring and pigmentation. Many products treat acne by drying the skin. This works in the short-term, but is not a good idea long term because dried-up cells exfoliate and die, then block ducts, which results in sebum accumulation, stagnation, and inflammation (acne). This acne treatment opens up ducts and rehydrates the skin. Follow it up with GelComplexNA (a medgel), which reduces scar appearance, acne treatments which doesn't make your skin sun sensitive and has no side effects. Will treat the spectrum of acne disorders from mild to the most severe. While wrinkle relaxers are not safe to use during breastfeeding, SQOOM is completely safe due to its all-natural, organic, chemical-free, and preservative-free German gels. SQOOM can also be used on breasts and stomachs post-birth to restore stretched skin. SQOOM completes the plastic-surgery process, making it a must-have post-surgery accessory. How does it work? Skin is like an elastic band, when it's stretched and pinned back, the elasticity goes and the texture differs. This means you can see a demarcation between the facelift areas and your natural face. SQOOM restores elasticity and rehydrates the skin for a perfectly even complexion. The use of wrinkle relaxers can result in the face looking unnatural and expressionless. 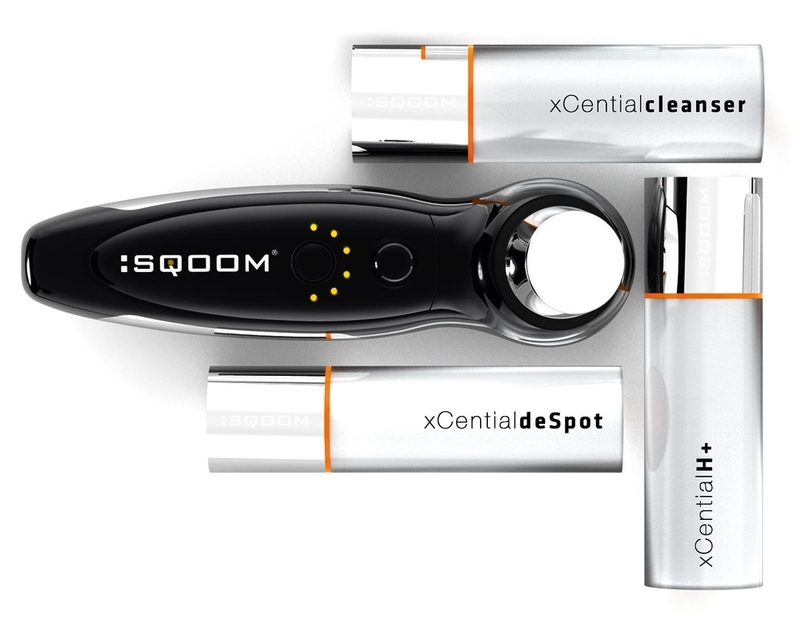 SQOOM allows you to show all your facial emotions, while your wrinkles stay smooth in a relaxed face. Regular wrinkle relaxer users can extend its effectiveness if they SQOOM their faces after wrinkle relaxer treatments (wait three days after treatment before using). The areas around the eyes are difficult to treat, so treating hollows and dark rings can be fraught with problems. For instance, fillers can cause 'panda eye' bruising or, if over-filled, big bags are created. SQOOM treats eye hollows and dark rings effectively with no bruising, bags or other complications. Air conditioned cabins can cause the skin to feel dry, tight, and dehydrated. SQOOM delivers aloe vera and hyaluronic acid via ultrasound and ionisation to deeply and effectively refresh the skin and rehydrate natural hyaluronic acid stores. This leave you looking fresh for your straight-from-the-airport meeting. SQOOM treatments are available to Lufthansa and Swissair passengers. SQOOM products are perfectly safe, natural, and not tested on animals. Every ingredient is expelled from the body naturally, products are well preserved in an airless safe delivery system with no preservatives and no toxic substances. Tha'ts why SQOOM has won so many awards. Shows how skin elasticity and firmness improves with regular use. SQOOM device and Complex AK is very effective in healing acne as it targets and reverses the causes of acne. The ultrasound component deeply cleanses all grime and sebum and exfoliates, keeping the ducts clear to discharge sebum. Salicylic acid is keratolytic and helps to separate the cells for exfoliation. Magnolol and Panthenol soothe inflammation. Hyaluronic acid hydrates and nourishes. Instead of skincare, this is a skin health program delivering HA better than ever before. Chemical free and organic products can be infused with a user friendly device that you can use at home.